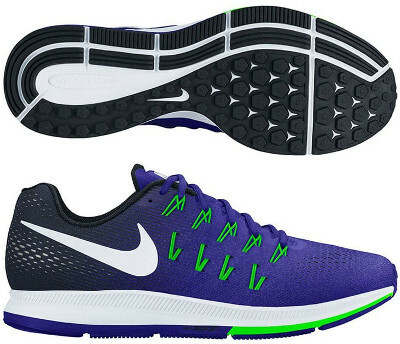 Nike Air Zoom Pegasus 33 are neutral cushioned running shoes. Once again the iconic Nike Air Zoom Pegasus 33 reaches the market promoted by the new 3000 british record's holder Mo Farah. Alberto Salazar's pupil is one of the most popular runners sponsored by the american brand although the Pegasus 33 is best suited for daily training and not track racing. The 33rd edition of the most famous running shoe ever keeps the spirit and versatility adding a second Zoom Air™ unit in the forefoot for more responsiveness. Upper gets an update compared with its predecessor the Pegasus 32. Breathable engineered mesh uses less exposed Flywire cables (similar to Odyssey) featuring custom fit. Reflective elements in the heel have been increased to improve visibility under poor light conditions. Full length Cushlon™ midsole provides great comfort and Zoom Air™ units (both heel and forefoot) make the Pegasus 33 more responsive. Few changes take place in the outsole playing with grooves here and there looking for more flexibility and smoother ride. Lugs located in the internal side have been moved to pentagonal shape to increase traction on any terrain.